Think metabolic. We have discussed de novo mutations as a cause of epileptic encephalopathies repeatedly on our blog. While there is emerging evidence that de novo mutations in established genes such as SCN1A or CDKL5 or novel genes including GNAO1 or CHD2 are a major cause of genetic morbidity in patients with epileptic encephalopathies, investigations for de novo mutations are not the immediate knee-jerk reaction in clinical practice. In fact, if a child presents with an epileptic encephalopathy, excluding inborn errors of metabolism (IEM) takes priority. 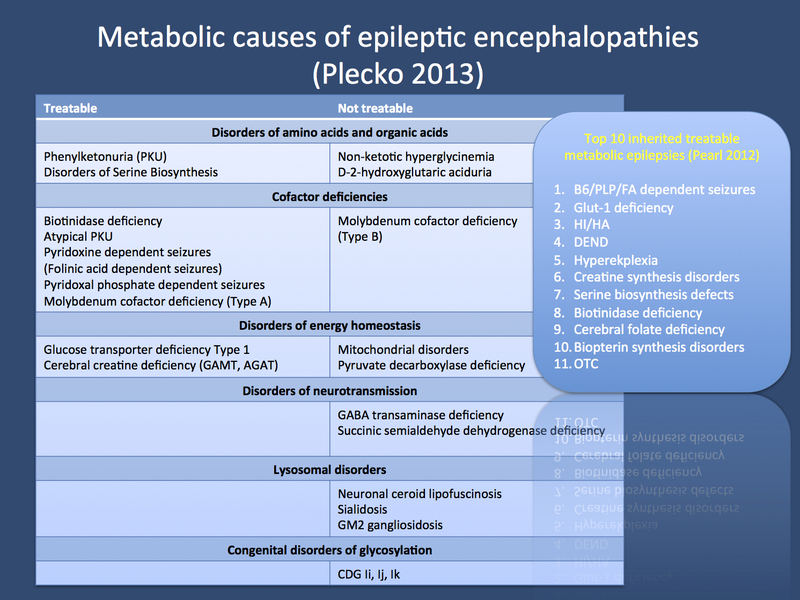 While metabolic causes of epileptic encephalopathies are rare, they need to be excluded as some of these conditions are treatable. In a recent review in Molecular Genetics and Metabolism, van Karnebeek and colleagues review the 89 causes of intellectual disability that are potentially treatable. Many of these conditions also present with epilepsy. They present an updated diagnostic algorithm and provide an online resource for these conditions – in a nutshell, there is an app for that. A systematic review. As part of the Canadian Treatable ID project, van Karnebeek and collaborators systematically reviewed the literature on inborn errors of metabolism (IEM) and extracted 89 treatable metabolic diseases that might present with intellectual disability. IEM are usually recessive or X-linked genetic disorders due to an enzymatic defect. Given that a metabolic abnormality is usually an associated feature, these conditions are frequently identified through metabolic rather than genetic tests with a few exceptions that are mentioned below. The prototypical IEM is phenylketonuria (PKU), a recessive disease caused by mutations in the phenylalanine hydroxylase gene (PAH). When untreated, PKU leads to intellectual disability and epilepsy due to the accumulation of toxic metabolites. Given that PKU is part of the newborn screening program, this condition is usually detected shortly after birth and can be treated directly. The treatable causes of ID. Van Karnebeek and collaborators mined the literature for evidence that intervention or treatment in certain IEMs will lead to improvement. Based on these criteria, they identified 81 IEMs already known in 2011 and 8 additional IEMs that were recently identified or where novel treatment options became available. These newly added IEMs include dihydrofolate reductase deficiency (treatment: folinic acid), VMAT2 deficiency (treatment: dopamine agonists), SC4MOL deficiency (treatment: cholesterol supplements), Brown–Vialetto–Van Laere/Fazio Londe syndrome (treatment: riboflavin), carbonic anhydrase VA deficiency (treatment carglumic acid), hypermanganesemia with dystonia, polycythemia, and cirrhosis (HMPDC) syndrome (treatment: chelation therapy) and mental retardation, enteropathy, deafness, neuropathy, ichthyosis, keratodermia (MEDNIK) syndrome (treatment: zinc acetate). In addition, Lesch–Nyhan syndrome, a known disease due to the toxic accumulation of oric acid was added as there was some evidence that patients might profit from hematopoietic stem cell transplantation. A full list of these conditions is listed in Table 2 and Table 3 of the publication that is freely available online. While the list of treatable IEMs presenting with intellectual disability appears very long at first glance, it should be emphasized that most of these conditions do not present as intellectual disability alone, but might have a number of associated features. However, as there are also atypical presentations, this raises the question as to how common these conditions are. How common? Metabolic disorders are individually very rare with a population frequency of 1:10,000 or less. Collectively, the authors suggest that roughly 1% of patients with ID may have an underlying causative IEM, but acknowledge that there are no good studies to base this data on. Compared to other screening tools in patients with intellectual disability including genetic testing for Fragile X or for microdeletions/microduplications, the yield is very low. Van Karnebeek and collaborators realize that the hunt for a possible metabolic disease may be endless and excessive and suggest a two-tiered algorithm, including blood tests and urine tests as the first tier. The suggested blood tests include testing for ammonia, lactate, plasma amino acids, total homocysteine, acylcarnitine profile, copper and ceruloplasmin. The urine tests include organic acids, purines and pyrimidines, creatine metabolites, oligosaccharides and glycosaminoglycans. Collectively, these tests should identity 60% of all treatable IEMs. To exclude the other 40%, the authors suggest targeted second-tier investigations based on particular phenotypic features that they have developed a online guide and an app for. For some of the metabolic disorders, a genetic test rather than testing for metabolites is recommended. Treatable epileptic encephalopathies. Intractable seizures can be a feature of treatable IEMs. However, as with metabolic causes for ID, they are extremely rare. None of the trio exome studies to date have identified patients with hidden metabolic disorders using massive parallel sequencing. The only notable exception is a study on autism in consanguineous families from the Middle East, where newborn screening protocols might be less comprehensive than in Western countries. When assessing the genes for the conditions listed by van Karnebeek and collaborators, there is no overlap in sequenced patients with epileptic encephalopathies, suggesting that these causes are in fact very rare. Some conditions stand out as IEMs that have epilepsy as a particularly prominent feature (as listed by Plecko or Pearl). The treatable causes include conditions such as Glut-1 deficiency and Vitamin B6 deficiency. Summary. The recent review by van Karnebeek and collaborators helps navigate the jungle of metabolic testing in patients with intellectual disability and is relevant to the work-up of patients with epileptic encephalopathies to certain extent. The amount of testing performed is still center-specific, which is also due to the fact that results for metabolic tests are almost always normal in patients with ID. In fact, the chance of having a false positive result due to transport problems, insufficient cooling or other factors is 10-100 fold higher than having a true positive finding. Nevertheless, establishing clear guidelines is paramount, particularly as some of these very rare conditions are potentially treatable. This entry was posted in 2014, autism, Epileptic encephalopathy, Opinion, Papers and tagged AGAT, Cerebral creatine deficiency, CHD2, Congenital disorders of glycosylation, D-2-hydroxyglutaric aciduria, Disorders of Serine Biosynthesis, folinic acid, GAMT, Glut-1 deficiency, GM2 gangliosidosis, GNAO1, IEM, intellectual disability, Lysosomal disorders, metabolic testing, Molybdenum cofactor deficiency, neurometabolic disorders, Neuronal Ceroid Lipofuscinosis, Non-ketotic hyperglycinemia, Ornithine transcarbamylase deficiency, phenylketonuria, pyridoxal phosphate, pyridoxine dependent seizures, SCN1A, Sialidosis, SLC2A1, Succinic semialdehyde dehydrogenase deficiency, TIDE-BC, treatable ID. Bookmark the permalink.